NAMM 2019: Charvel has hit the mark for modern players with the launch of their new high performance USA Select DK24 HH 2PT CM guitar, made by the crack team at the company’s custom shop in Corona, California. At the core of the DK24 is an alder body with sculpted heel, paired with a two-piece bolt-on quartersawn caramelized maple ‘speed’ neck with graphite reinforcement, plus a smooth hand-rubbed urethane back finish. A scalloped lower back works in tandem with the shredder cut heel, allowing easy access to the upper fretboard. Built for highly-technical playing, the guitar’s 12”-16” compound radius fingerboard features rolled edges for added comfort, 24 stainless steel jumbo frets, pearl dot inlays and a Graph Tech TUSQ XL nut. For the DK24, Charvel has opted for an HH pickup configuration consisting of a direct mount custom Seymour Duncan Full Shred SH-10B bridge pickup and direct mount custom Seymour Duncan Alnico II Pro APH-1N neck pickup, to produce a full, rich and versatile tone. Other features include a five-way blade switch, two-way toggle (series/parallel) switch, Stratocaster-style skirt knobs for the volume and no-load tone controls, Gotoh Custom 510 recessed tremolo bridge with titanium saddles and thick brass block, USA-made Sperzel locking tuners, chrome hardware and hardshell Charvel case. 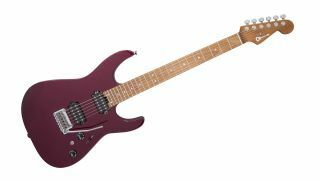 The guitar is available in Oxblood or Satin White finishes and will cost a cool £2,639. Visit Charvel for the full lowdown.